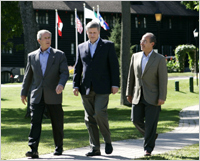 In August 2007, the governments of Canada, Mexico and the United States established the North American Plan for Avian & Pandemic Influenza (NAPAPI), as part of an evolving trilateral system of regional cooperation. Under its mandate, this transnational organization had the responsibility for coordinating the influenza prevention plans of the three countries, providing assistance where necessary, and preventing the disruption of cross-border trade. During the A/H1N1 influenza pandemic of 2009, the NAPAPI fulfilled its promise by helping the three national governments deal with this public health crisis, as well as maintaining the principles of the North American Free Trade Agreement (NAFTA). This study examines the historical development of regional health security since the 1950’s, with special emphasis on the role that Canada assumed in the development of important collaborative arrangements that established the ground-work for the North American Plan for Avian & Pandemic Influenza.